There is something special about a collection that is conceived and created in rural Nepal, but designed and sold in urban Dalston. East London sustainable fashion shop studio Here Today Here Tomorrow (HTHT) has designed its first womenswear collection inspired by, and handcrafted from, traditional Nepalese dhaka fabric. Having visited Nepal to meet with their suppliers, the four HTHT founders and creative partners came across dhaka, a striking handwoven cotton fabric which is traditionally used to make the Dhaka topi, a hat worn primarily by men and in particular by Nepalese Governments officials. In recent years however the popularity of this unique fabric has fallen in favour of western designs. This market decline means that the art and skill of dhaka weaving is at serious risk of becoming extinct. HTHT wanted not only to help keep this heritage alive but also to support and empower the skilled female weavers, pattern cutters and sewers who work with dhaka fabric. Ethical production is paramount to HTHT so, to ensure the collection truly supports the communities in which it is made, the London-based sustainable fashion collective is working with Association for Craft Producers (ACP) ‘who encourages and organises women to turn their traditional craft skills into a profession’. ACP are certified by the World Fair Trade Organisation (WFTO) and as such they work to conserve their environment and ensure the artisans they work with receive fair pay and benefits such as medical care and educational support for their children. 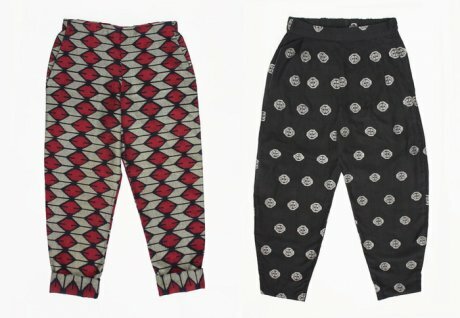 This simple and stylish capsule collection of tops, cropped trousers and accessories blends the best of both worlds: the unique, handwoven fabric from the East is given a fresh, contemporary design twist making the resulting pieces truly appealing to a new, and fashion-forward Western audience. Pledge £25 to receive a lined dhaka fabric purse (above right). Pledge £35 to receive a large lined dhaka fabric purse (above centre), ideal as a wash bag, make-up bag or clutch. Pledge £60 to receive a dhaka fabric tote bag (above left), which features durable straps and base made with a leather sourced locally in Nepal. 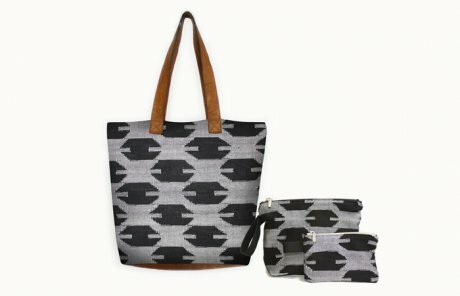 Pledge £95 to receive the full handmade and handwoven accessory collection: dhaka fabric tote bag, purse and wash bag (above). Pledge £100 to receive the contemporary dhaka top (below), available in small, medium and large. Pledge £100 to receive the cropped Dhaka fabric trousers (below), available in small, medium and large. EARLY BIRD price for the first 5 supporters. Pledge £300 to receive the full HTHT dhaka collection: top and trousers (below), bag, purse, large purse, key ring, and brooch. The HTHT dhaka crowdfund campaign runs until Friday 8th August 2014.